Love a good marinade for chicken breast? Try this and tell us what you think. Put the vinegar, herbs, mustard, and garlic powder and oil in a large re-sealable plastic bag. Close the bag and shake to combine all the ingredients. Open the bag, drop in the chicken breast in the bag. Close and shake the bag to coat evenly. Heat a grill or grill pan. When the grill is hot, place the chicken on the grill and cook for about 4 minutes per side, or until cooked through. You can also bake the chicken in a 375 degree F oven for 15 minutes, or until cooked through. 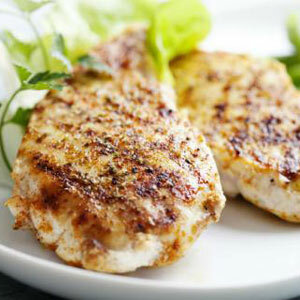 This entry was posted in Chicken, Entrees, Modified Profast (Fast and Flexible) Recipes, Nutriplus Recipes (Balance Your Pyramid), Uncategorized and tagged Chicken, chicken breast, grilled chicken, marinade by foodies4mmc. Bookmark the permalink.